Spray gun set Plus 26451100 https://www.kaercher.com/ie/home-garden/watering-systems/nozzles-and-spray-lances/spray-gun-set-plus-26451100.html Robust spray gun set Plus for watering small areas: Spray gun Plus, 3/4" thread tap connector with 1/2" thread reducer and universal hose connector Plus with and without Aqua Stop. Spray gun set Plus with adjustable spray pattern from full jet to mist spray for watering small areas and gardens. The ergonomic handle allows convenient one-hand operation for effortless watering of all kinds of plants and for cleaning gardening tools and furniture. This innovative spray gun also offers a host of other features such as infinite flow control as well as automatic locking and release. This gun combines an attractive design with ease of use and a range of useful functions. In brief: the ideal solution for numerous uses in the garden. Note: Kärcher spray nozzles are compatible with all available click systems. 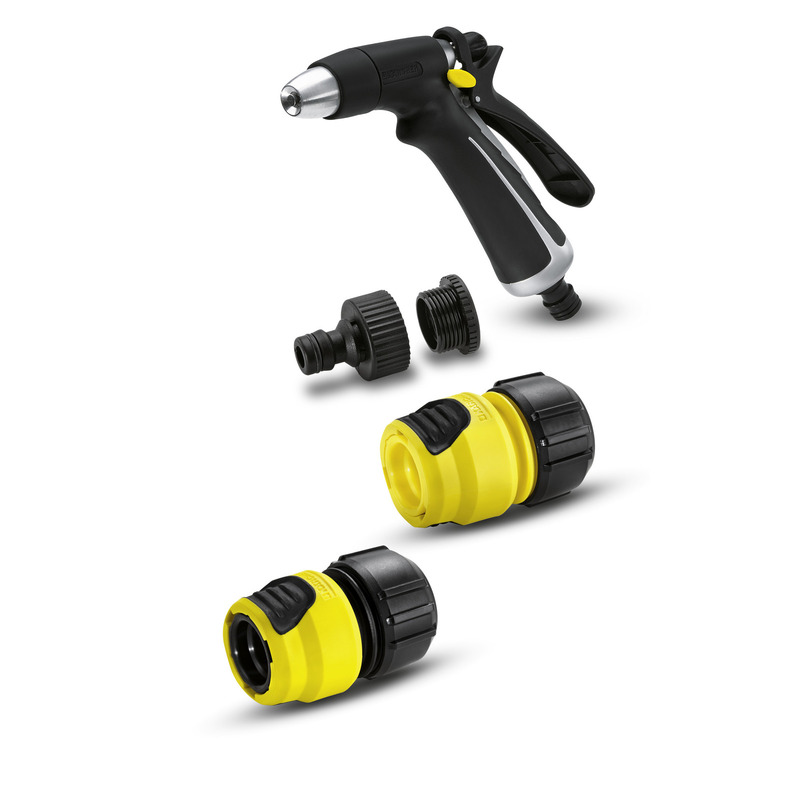 Spray nozzle set includes: Spray gun Plus 2.645-048.0, 3/4" thread tap connector with 1/2" thread reducer 2.645-006.0, universal hose connector Plus 2.645-003.0, universal hose connector Plus with Aqua Stop 2.645-004.0.